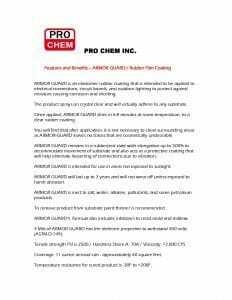 Armor Guard | Pro Chem, Inc.
ARMOR GUARD is a waterproof, flexible and permanent rubber coating that will act as a barrier against moisture-causing rust and corrosion even when totally submerged. ARMOR GUARD can be applied to provide a rubberized body that conforms to any surface with an extremely tight bond. 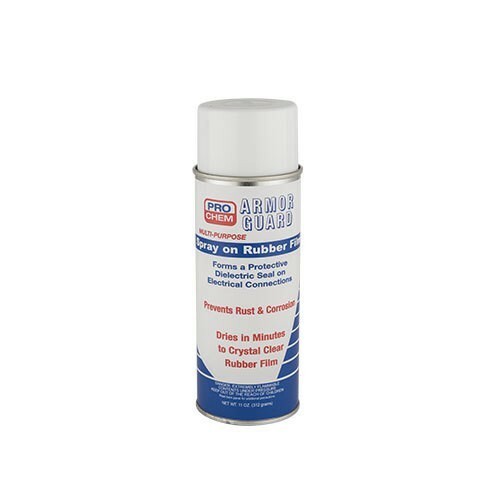 Dries crystal clear and will not discolor or harm any surface. ARMOR GUARD is ideal for use as an insulator for electricity. The volume resistance of this material makes it ideal for use on terminals to protect against corrosion and moisture. It can also be used as an insulator in connection boxes and exterior wire connections. ARMOR GUARD is intended for use in areas not exposed to sunlight. Shake well for 30 seconds. Apply to clean dry surfaces. Hold can 6 to 8 inches from object. Spray in short even coats until thoroughly coated. Let dry for 15 minutes before use. If using on circuit boards or electrical connections, let dry for one hour before activating. Clean up or remove with paint thinner. Intended for use in areas not exposed to sunlight. 11 oz. can covers approximately 60 square feet.